With aeromodellers of the golden control line years being mainly boys and young men, some serious pranks seem almost inevitable. Aeromodellers camped together for a week during the annual national championships, providing a formula for creating many memorable incidents. Anyone who has a story worth re-telling is invited to contribute it to this page for others to enjoy. Rumour has it that the city fathers of the Victorian country town of Traralgon vowed never again to invite aeromodellers to visit, following revelations a few months after the nationals of 1956 that many of the local school girls were pregnant! "It was my first Nats, and I don't think Dizzy and I got more than an hour or two of sleep each day... we flew planes all day, (FF and CL) and 'played' all night. The Hospital was one of our favourite spots to visit. "It certainly could be dangerous to go to sleep during those nationals. One modeller was amazed to discover that he had been carried very quietly by us in his bunk out onto the football oval and left there until he woke at 4am frozen... it was very cold at Traralgon even though it was summer time. He was in fact very upset when he came back into the dorms we were all in, without his bed of course... too heavy for one person to carry. For the life of me I have no idea who the bod was... perhaps he resigned from flying??? "The other terrible thing we did was spread CL wire on a bed with a Ford coil and battery attached... of course when this was tossed off the bed there were huge shocks involved... several were 'got'. But not me. "Water pistols made the scene, and there were plenty of wet bods and beds, but it all became very stupid when someone put glo fuel into one... we called it all to a halt then. Very stupid and dangerous. "Have you heard about the car trial? Dizzy was my navigator and we got absolutely lost... came into a town from a strange direction having no idea where we were... and guess what... we were back in Traralgon having somehow done a 180 turn somewhere out in the bush. We were the laughing stock for days. There is mention of this in an old Aussie mag, but no names used... thank The Lord. "We survived and got home okay, but tired. Dizzy was killed just before Christmas of '59 when he ran his motorbike into a lamp post. Very sad indeed, and only 18." Only sketchy details are available of an event thought to have taken place at the 1961 Nationals at Echuca, Victoria. In those days, a stylish lightweight mini sportscar made of fibreglass and called the Goggomobile Dart was manufactured in Australia, and one of these was the pride and joy of one John Pfeifer, winner of class 3 teamrace at the previous Victorian Nationals. It seems that in the dead of night, persons unknown carried John's car into a nearby grandstand, lifted it onto the raised seats therein, and left it there. It is not known how John managed to get his car off the seats next day, but apparently police offered no help when the matter was reported to them. 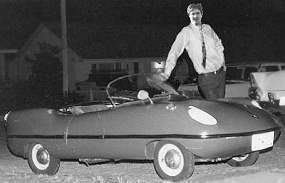 However it was done the Goggomobile remained almost unsighted for the remainder of the Nats, as John made sure he kept it well hidden! For an insider's report of this incident, click here! It was at the 1964 Western District Championships held at the showgrounds of Warrnambool, Victoria, that a few sheep had been left to graze as four legged lawnmowers. And it was the sheep that inspired a bit of mischief one night, directed at a tent in which the winners of the class 2 teamrace event lay awake late into the night, re-living their great deeds and triumph of the previous day. Around midnight when the heroes finally drifted off to sleep, persons unknown herded a big sheep into the tent, leaving it to blunder around in the dark and rudely wake the occupants. Above the bleating and swearing only cackling laughter could be heard, bearing a strong resemblance to that of Geoffrey Lawson! You can read the confession of one of the perpetrators here. More of a disaster than a prank occurred at the Heatherton control line venue of the 1964 Melbourne Nats. According to reports, Stuart Sherlock's stunter somehow separated from its lines and speared into the side window of a Holden station wagon parked nearby. Needless to say, the Holden fared better than the stunter, as our picture shows. But how did the plane come off its lines? "The model was of course a Thunderbird Mk 2. The Holden S/W which had the model enter the left rear door window was actually the one collecting the garbage for the day!!. Both lines had broken at the centre of the handle as there was no reinforcing where the lines came thru the holes. I was there and watched it happen!!!" "The first West Australian Nats in 1967 were an adventure for modellers from eastern states" writes John Quigley. "The Late Ron Neville attended, as usual with a tribe of juniors with him. Ron's Junior assistance detracted from his own efforts in Nats contests and until this time he had not won a nats event. But this time Ron flew in Combat (the real one with 0.40ci) and won! 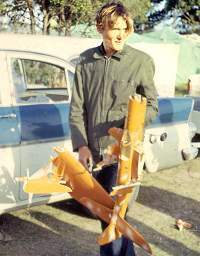 "The local paper at Northam published a photo of Ron after his win with all his busted combat models. The caption called him a "ground level Biggles". "This did not go un-noticed by Basil Healy and myself. We obtained a 4inch tin pie plate and 2inch red ribbon and from these fashioned a magnificent medal including control line wire and broken prop. At the presentation dinner Ron was ordained with the peerage: Royal Order of the Busted Prop with Wire Entanglement!" 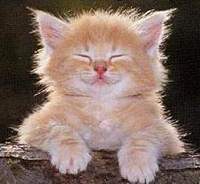 "The only time we got into trouble with the police was when Ralph Brough mugged an old lady's cat by holding an ether soaked rag over its face until it staggered away like it was drunk. The big fat local police sergeant rode his bike over to Davis Oval and made us all sit on the grass while he gave us a lecture. Eventually, after we all promised to be good and not cause him any more 'pain and paperwork' (his words), he then sat down with us and talked about model aeroplanes. He turned out to be a good bloke and we developed great respect for him, so we tried very hard not to get into trouble again. Ralph copped all the blame for this prank as he deserved to do ... but it had taken four of us to hold the cat down!" "One day when we were flying at Peppermint Grove the local council park officer came down and told us to leave because we were making too much noise. We left, but that night we all went around to his house and made a lot more noise by chucking rocks on his tin roof. Next week we flew at Peppermint Grove again ... but the council officer didn't show up and we never saw him again!" Athol Holtham's VolksWagen seemed jinxed every time it attended a Camden Nationals, suffering a broken windscreen here in 1958, then being written off in a roll over accident at the following one in 1962 as it was being driven home from a party by a well-meaning friend. 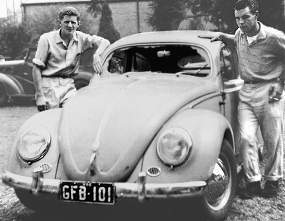 But it was on the way back to Melbourne after the 1958 Camden Nats that Athol feared his VolksWagen would become Australia's first car bomb! The explosive in this instance consisted of one large bottle of nitromethane stowed securely underneath the lid of the boot at the front of the car. It was not a head-on crash that worried Athol, but reports that a whole train containing nitromethane had exploded with disastrous results in the USA, apparently caused by the nitro getting a bit hot during some hot weather. And of course it was on a particularly hot day that Athol and his friend Peter Ellis departed Camden in the VW. All went well while Athol kept the car moving to make a nice cooling breeze, but as they entered the town of Jugiong a police roadblock forced them to stop and wait for far too long under the blazing sun. As the car cooked, onlookers were somewhat puzzled at the sight of Athol and Peter nonchalantly draping themselves over the boot of the car as they tried to keep their cargo cool whilst they waited... and waited. Fortunately the police were too busy to notice and eventually allowed the car to proceed before an explosion occurred! According to very secondhand information, back in the days before Ivor Stowe changed his name to Ivor F he earned himself the nickname of "Yogi" for some of the feats he performed at Nationals. Apparently he could lie down on a camp stretcher and go instantly to sleep regardless of noise and distractions all around him, even when the noise included engines being run only a few yards away. But there came a time when somebody devised a scheme for waking him. A trembler coil is a device used for creating a continuous series of electrical sparks, commonly employed when starting pulse jet engines. With one lead from just such a trembler coil clamped around the big toe of the sleeping Yogi and the other lead connected to the metal frame of his camp stretcher, great was the expectation as a battery was connected. According to reports, Yogi sprang four feet into the air before dislodging the lead from his big toe, whereupon he sank back onto his stretcher, asked dazedly what had happened, then rolled over and went back to sleep! Another legend dating back to Nationals of the late nineteen fifties concerns the phantom bugler. Probably unrelated to the phantom rock-thrower of Noble Park, our Nationals phantom would wait until the quiet early hours of a morning before waking all the campers with his bugle calls, then disappear before being seen. Quite a number of people wondered about his identity... so... who was it? 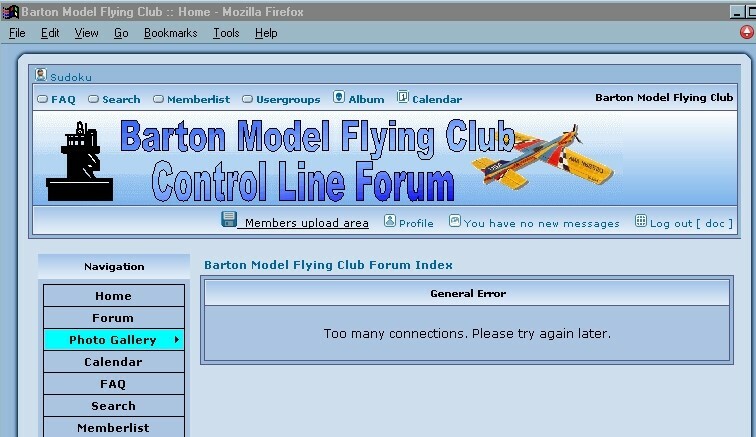 By way of introduction I should explain that the "too many connections" error message Ken refers to has since been documented with a screen capture of the message as received, has been seen by other forum members, and acknowledged as a problem by the forum administrator. I can assure you, David, that the server is VERY smart. Smart enough to know that you are talking a load of CRAP where you have just experienced, since Jim's relevant post, a "too many connections" error message, or anything remotely like it. With our server functioning, it's simply not possible for that message to be generated. Should you doubt this, then investigate the operations of Unix/Linux servers and associated Apache software. Certainly, an added intercept routine could do something like that, but we would equally certainly know if such was in operation. Oh Dear! The server's been hacked. Should you think that, your paranoia is showing. We would know immediately if that were to happen, as today's server security is miles ahead of whatever you may have experienced in the past. Perhaps this hacker is selectively targeting just you? No-one else has ever mentioned anything like it. You are once again moving back to your "always finding a reason for criticising others" mentality. Do you really need this constant ego-boosting? Cool it, and cool it NOW ! I trust you understand me. We have a mountain of sanction functions to apply if you continue in this vein. Jim is a lot more accepting of people's little foibles than I, but he doesn't know you as well as I either. Added to that, I will have no compunction whatsoever against kicking you out for good, because you always end up being more of a pain in the arse than of benefit to anyone in Barton. LISTEN, and listen good. Your place here has never been in greater jeopardy. I'm not exactly in the mood to deal with your stupidity right now, so my fuse may be shorter than you would like. I was competing in open combat at the Sydney C/Line Championships, in 1970, which were always held at Centennial Park, in Sydney. During a very intense bout, somehow I managed to cut both lines of my opponent's model. It flew away from the flying circles, and crashed into the middle of the large lake nearby. My opponent, who I did not know, ran to the lake edge, stripped down to his underpants, ( this was the middle of winter ) then dived into the cold, murky, polluted water, and swam out to retrieve his model. I was expecting him to be very irate, and blame me for deliberately cutting his lines. But nothing happened, and I conclude this was part of combat competition. I then began flying radio for the next 30 years, and had nothing to do with c/line flying until my friend and I decided to have a look at the c/line flying, at the Richmond Nationals. While there, I was relating this story to some control line flyers, when one of them said to me, "I am that person who dived into the lake that day. After getting back to shore,and standing there, blue with the cold, still in my underpants, this boy comes over to me, and asked, would I retrieve his model yacht for him!!!" 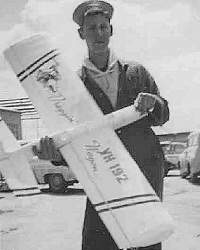 The flyer was Bill Swan from the United Club, who is still flying c/line aerobatics today. He told me there never was any animosity towards me. Developed 1999, revised June 2009 by David Kidd. Your Webmaster is Ron Chernich.